Thoughtful educators realized that these digital pets provided children with a personal connection to systems thinking, senses, emotions, artificial life, computer science, cybernetics, probability, elapsed time, human development and other complex concepts. While most schools were prohibiting these pets, Logo teachers around the world were independently developing Logo-based activities which used digital pets as a powerful motivational force for learning. Adam Smith, an Australian educator and software developer (www.schoolkit.com) devised a simple set of starter procedures for creating a digital pet. The project introduces buttons and text boxes. Students with little MicroWorlds programming experience may successfully create a digital pet and add their own personality traits to their creature. Ive added a few extension ideas to what Adam created. What is a Personal Pet? Say 'Hi' to Stroops, my Personal Pet! Like all pets, Stroops has needs and feelings. When you adopt your pet, it will get hungry, so you will need to feed it. To keep it happy, you will need to hug it regularly. Once you have adopted a pet you may like to add more characteristics. For example, you might like to have your pet become lonely unless you play games with it. To adopt a Personal Pet you need to 'bring it to life' by writing a MicroWorlds program. As you work on your pet, be sure to save your project regularly. This text box will display a number to show how hungry your pet is. This text box will display a number to show how happy your pet is. The pet may use this text box to display messages. This button will start the Personal Pet program. Click on this button to feed the Personal Pet so that it is not hungry. Click on this button to hug the Personal Pet to make it happy. Now it is time to program the Personal Pet. On the Procedures Page enter the procedures written below. MicroWorlds text boxes may be used as visual variables. They display their values constantly and may changed and operated upon under program control. 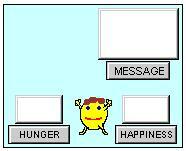 A text box, HUNGER, has a corresponding one-input command, SETHUNGER, designed to change its contents. We will use the SETUP procedure to set starting values. For example, the Personal Pet begins with a Hunger level of 20. In HOUR we will put everything we want to happen each time a pet hour passes. For example, each hour the Personal Pet becomes a little hungrier. When you click on the FEED button, the Personal Pet becomes less hungry. Question: Why do pet hours go by so quickly? Answer: For the purposes of debugging, testing and program design you dont want to wait three days to determine if your program works correctly. Therefore, well speed up time. Once your program works to your satisfaction, you might wish to change the hour to take longer than the 6 seconds specified in the LIVE procedure. Click on the LIVE button. The Hunger level of your pet should go up slowly. Click on the FEED button. With food the Hunger level should go down. Dont feed the pet. Eventually it should die from hunger. Read through the program a few times, making sure you understand how it works. With the basic program working, it is time to extend the program. Go to the Procedures Page and add to the procedures in the ways detailed below. Lets add Happiness to the pet. In the SETUP procedure, add the line shown here in italics. The values set in SETUP were chosen arbitrarily based on their ability to make the simulation run well. The number (40) used to check the hunger of the pet in the HOUR procedure may be is also arbitrary. If you dont like the way the virtual pet behaves, feel free to adjust the values set in SETUP or HOUR. Each HOUR, without hugs, the pet gets lonely and a little less happy. Add the line in italics. Notice that we represent getting unhappy by subtracting 1 from the happiness variable. We need to be able to hug the Personal Pet to keep it happy. Add this procedure. Now go back to the main page to test the Personal Pet. When you are sure it is working properly, you could add another characteristic such as education or fitness. You may also add a sound to the live, feed or hug buttons to provide aural feedback for your actions. Alarm sounds might be added to alert the user to unhappiness or starvation. Since the HOUR procedure checks the condition of the pet, you should put new conditionals there. Checking for an unhappy little critter might look something like this. The new lines are in italics. The EVENT procedure picks a list of instructions randomly from a larger list and then runs that instruction. We need an EVENT to happen randomly. In the HOUR procedure add the line in italics. This change makes the EVENT procedure run based on a probability of 1 out of 12 times. Now its time to test the procedures again. Occasionally, your pet should announce a special event. When you are sure the program is working properly, you might want to add some more events of your own into the EVENT procedure. Perhaps your pet can get ill or learn. You now have a basic Personal Pet. There are a number of ways you can make your pet more interesting and active. If you are looking for ideas, think about all of the things a real pet does. Add more characteristics and more events and link them together. For example, you could make it rain occasionally. If the pet is not inside some shelter, it could get cold and unhappy, or even sick. Add animation to show such things as your pet eating its food or going for a walk. Design different shapes representing your pet as a baby, child, teenager and adult. Keep track of the number of years (some combination of elapsed pet hours). At a particular age, use SETSH to change the appearance of the pet. This will give the appearance of growing-up! You can even use some variation of SETSIZE SIZE + 1 in the intervening years to cause the pet to grow while aging. Invent a game that you can play with your pet. Send Your Virtual Pets Out to Stud! Please share the virtual pets created by you and your students with Logo Exchange. We will publish cool programs and screen shots in future issues. Logo Exchange would be happy to publish some of these pets on our web server too. Send projects and screen shots to logoexchange@stager.org. Adam Smith is well known as a veteran classroom teacher, administrator and Logo user across Australia. He recently created the Windows-based software package, Schoolkit, an expanding library of creative activities designed to help teachers and students use open-ended software tools like MicroWorlds and Microsoft Office. A special free sample version of Schoolkit is available to Logo Exchange readers at http://www.stager.org/schoolkit. Adam may be reached at http://www.schoolkit.com/. MicroWorlds is a registered trademark of Logo Computer Systems, Inc.